Live Industrial introduces the BEL 505G3 semi-automatic case former and pack station that can process up to 15 cases per minute. 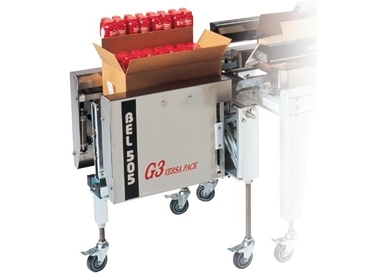 The heart of BEL semi-automatic case packing systems, the BEL 505G3 semi-automatic case former and pack station is an extremely compact range of case formers that incorporates all the ergonomic innovations of its predecessor model, the BEL 505. Integrating with a variety of sealers, the BEL 505G3 semi-automatic case former and pack station enables a single person to form, pack and seal corrugated cases in a single operation. The BEL 505G3 allows greater efficiency to the operator by providing the flexibility to pack from one of three sides of the case, optimising floor space in packaging lines where space and operator orientation may be restricted. The BEL 505G3 case formers are ideal for packagers looking to further improve ergonomics and increase productivity. The BEL 505G3 semi-automatic case former and pack station can be integrated with the BEL 150 case taper, A32 accumulation table and KDF box stand to create a complete solution.